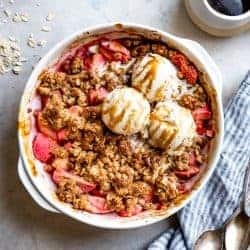 Warm apples, buttery spiced streusel, and a scoop of drippy ice cream melting over the top – this foolproof gluten free apple crisp makes a cozy dessert on chilly fall and winter nights. Use dairy-free butter and ice cream to make it vegan, or swap in peaches or berries during the summer. 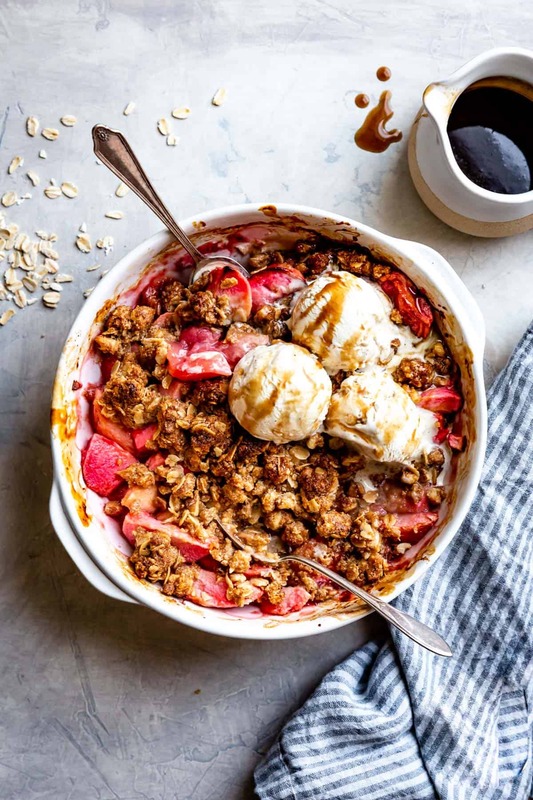 I adapted this gluten free apple crisp recipe from a hazelnut cranberry pear crisp that I developed for GFF: Gluten Free Forever Magazine last fall (the issue is available here for download). I loved the way the nutty streusel stood up to the baked fruit, so this year when I found pretty pink pearl apples at the co-op, I made an almond flour version of the topping. I drizzled some butterscotch sauce on top because why not? It was love at first bite. I’m highly opinionated about crisps. First and foremost, the topping should live up to its name, holding its own in the oven rather than sogging into the juicy fruit. There should be a good fruit-to-crisp ratio so that you get a little bit of each in every bite. The fruit should have good acidity to contrast with the sweet streusel topping. And the topping should smack of butter and brown sugar, with chunky elements from oats and nuts, and a whiff of spice. There should be enough sugar and butter in the topping that it melts ever so slightly into the fruit as it bakes. A few key techniques and ingredients make this crisp shine. Gluten free crisp topping can be tricky since many gluten free flours tend to become soggy when met with bubbling, juicy fruit. But this one holds up beautifully thanks to a trio of flours – almond flour, oat flour, and tapioca flour. Together with butter and brown sugar, they make a pebbly topping that tastes like crisp oatmeal cookie. Rolled oats and pecans or walnuts add chunky texture, while brown sugar and a hint of cinnamon and nutmeg add fall spice that contrasts bright apple filling. Just mix the dry ingredients together and stir in melted butter or vegan butter until the topping clumps together. 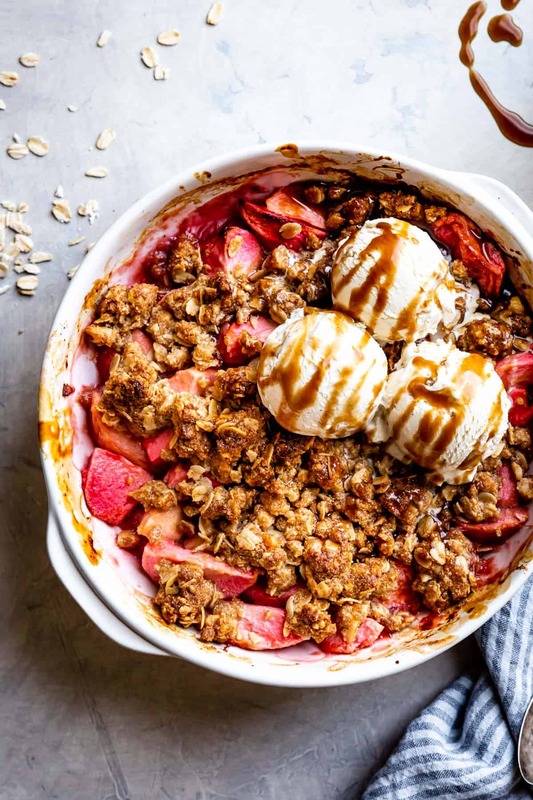 What are the best varieties of apple to use in an apple crisp? Choose apples that have good acidity and hold their shape when baked. 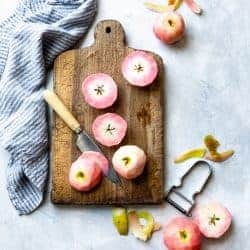 Pink pearl apples, used here, don’t just look pretty, they also make a bright, flavorful filling. 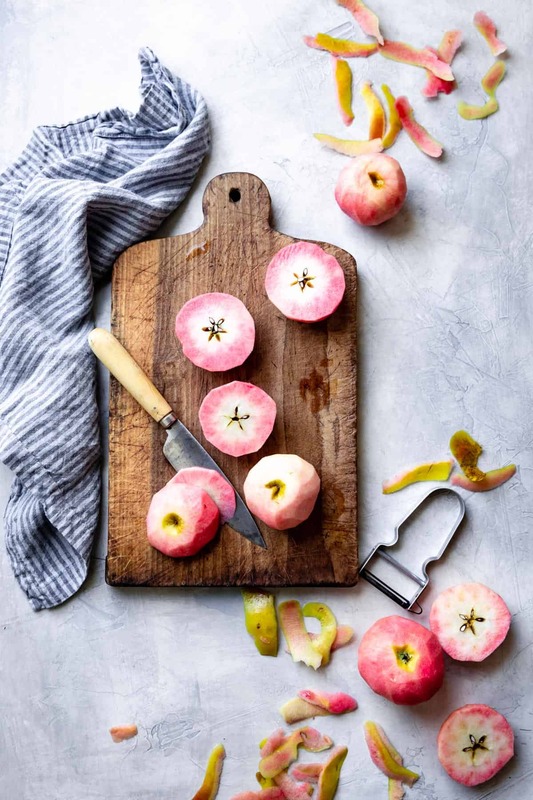 Granny Smith, Pink Lady, Honeycrisp, Braeburn, Fuji, Cortland, and Gala and heirloom varieties such as Winesap, Belle de Boskoop, and Northern Spy all bake into nice, tangy crisps. You can also use a mix of the firmer apples mentioned above, plus some softer apples such as Gravensteins or Macintosh. Prebaking the apples is essential when making apple crisp and serves three purposes. First, it draws out the juices from the fruit ensuring a gooey bottom layer. Secondly, stirring the warm fruit before adding the topping ensures even baking. And third, it releases steam from the fruit, helping the topping stay crisp. Some sources say the the difference between crisp and crumble is regional. 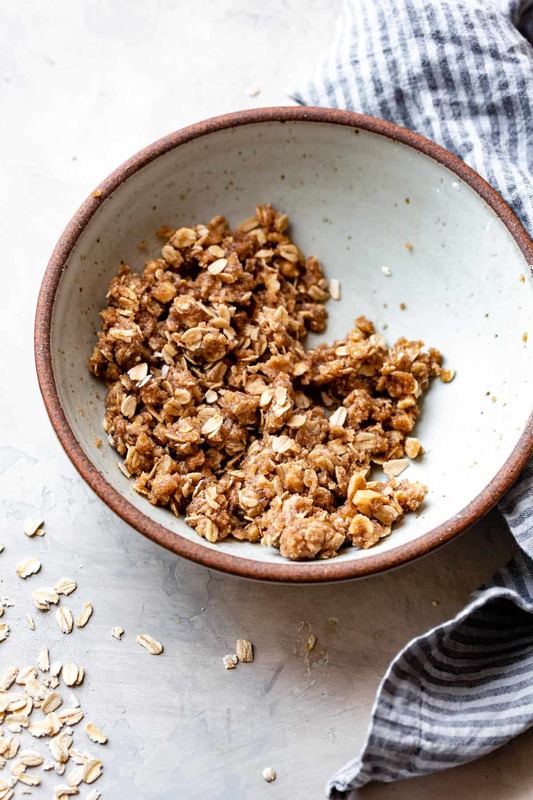 Others insist that crisp toppings contain just butter, flour, and sugar whereas crumbles use bigger, chunkier ingredients such as oats and nuts. Some recipes use leavening such as baking powder for a lighter topping. And still others assert that the two terms are now used interchangeably: crisp = crumble and vice versa. 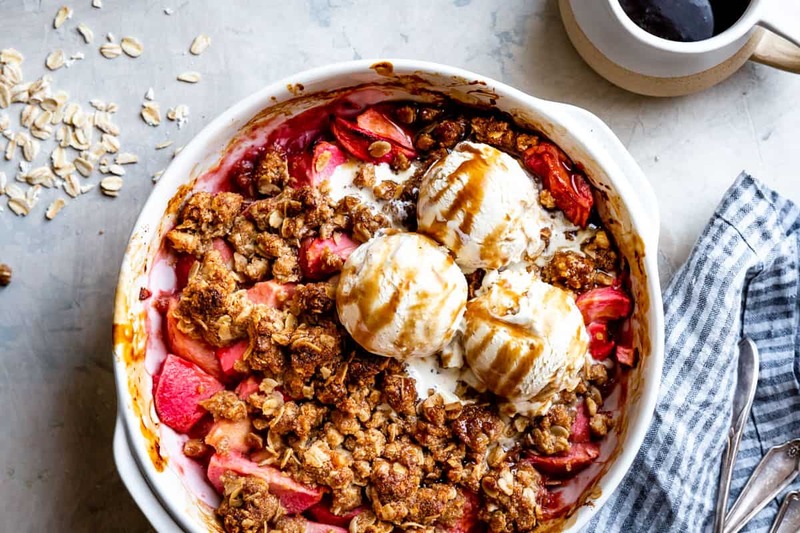 For me, I’m never one to quibble over a crumble or a crisp as long as there’s a rustic fruit dessert in my face! Are you as crazy for crisp as I am? Here are some of my favorite versions. And if you’re still hungry for fruit desserts, pick up a copy of Alternative Baker: Reinventing Dessert with Gluten-Free Grains and Flours. It has over 100 recipes for gluten-free, whole-grain, fruit-forward desserts including a whole chapter dedicated to crisps, cobblers, and pandowdies. 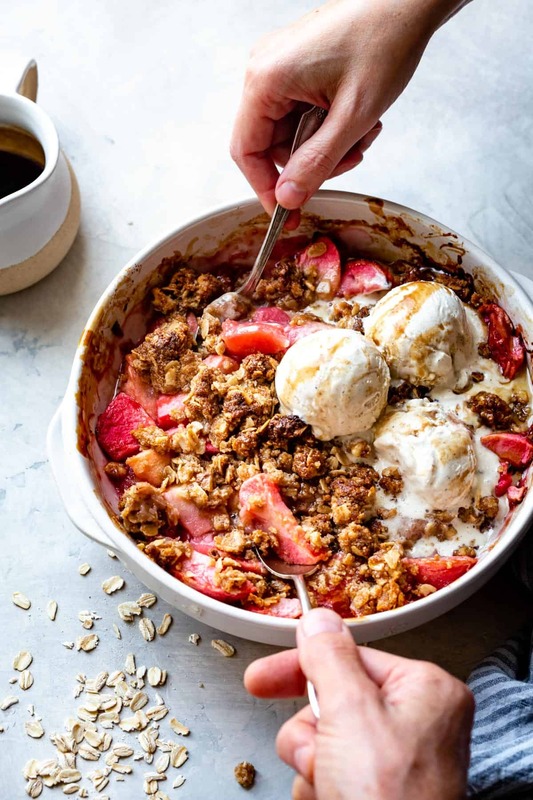 Apple crisp or apple crumble - whatever you call it, this sweet-tart, lightly spiced dessert is easy enough to make on a weeknight. 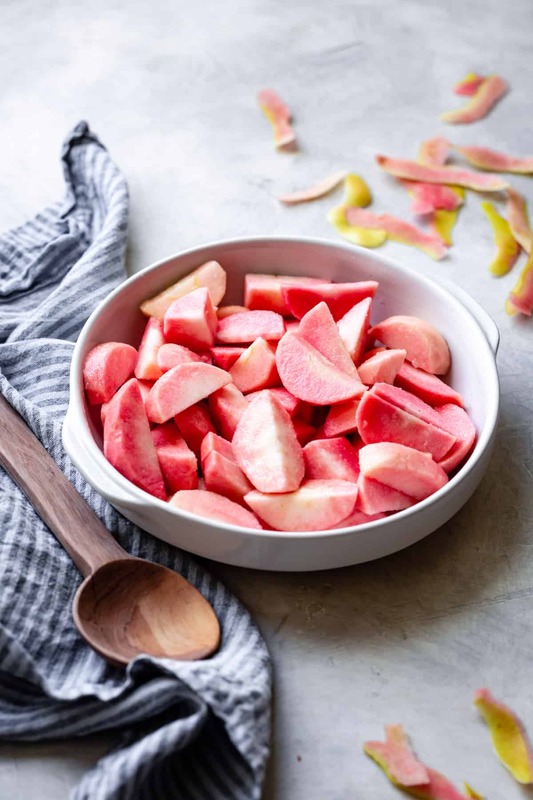 Mix it up by using peaches, nectarines, cherries, or berries in the summer, or try other fall fruits such as pears, cranberries, persimmons, or quince, all sweetened to your taste. Try the hazelnut variation, below. For nut allergies, try using finely ground sunflower seeds in place of the almond flour and pumpkin seeds in the topping. 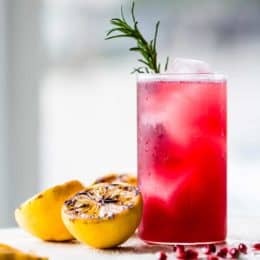 To serve a crowd, double this recipe and bake it in a 10-inch skillet, or triple it and bake it in a 9 by 13-inch baking dish, increasing the bake time as needed for the fruit and filling. In a large bowl, toss the apple wedges with the lemon, whiskey, sugar, cornstarch, and salt. 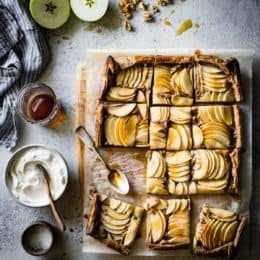 Place the apples in an 8-inch round baking dish, pie plate, or ovenproof skillet (or a 9 by 7-inch oval baking dish, or another baking dish that the apples fill). 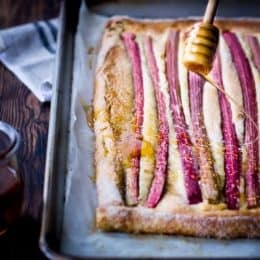 Place the baking dish on a rimmed baking sheet to catch any drips, and bake until the apples are juicy, 20-25 minutes. Gently stir the apples to redistribute. 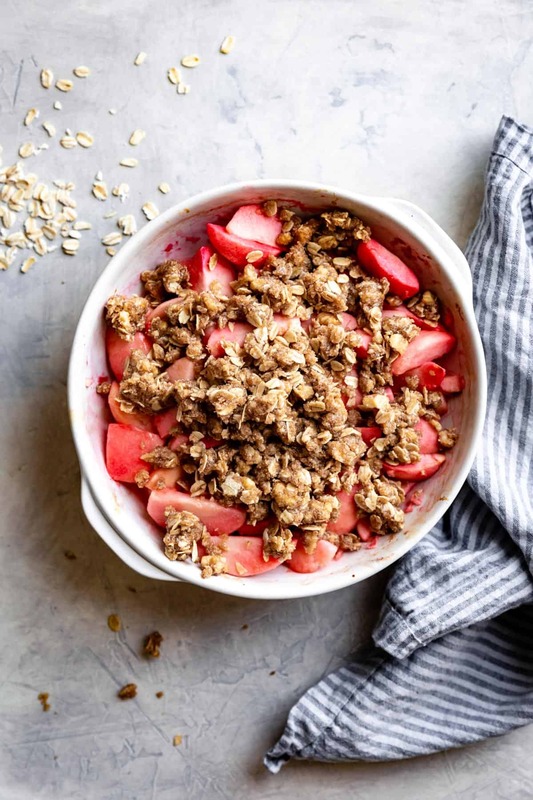 To make the topping, combine the almond flour, oats, nuts, oat flour, tapioca flour, brown sugar, cinnamon, nutmeg, and salt in a medium bowl (you can reuse the apple bowl if you scraped it clean enough). Stir in the melted butter until the mixture forms large clumps. When the apples have baked, sprinkle the topping over the fruit. Return to the oven and bake until deep golden and bubbling furiously, 20-30 more minutes. 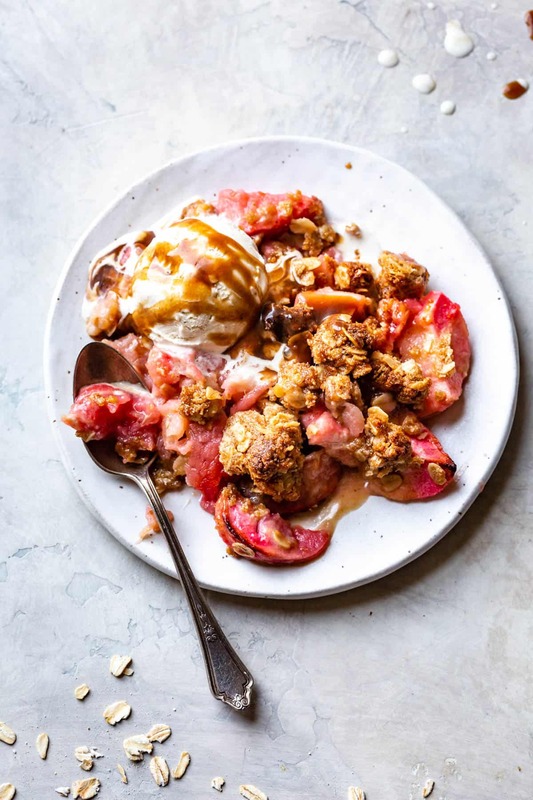 Let cool for a few minutes or to room temperature, then spoon into bowls and serve with ice cream and a drizzle of butterscotch sauce, if using. The crisp is best when freshly baked but leftovers keep, covered and chilled, for up to 3 days. Enjoy cold or warm. Use hazelnut meal instead of almond flour and hazelnuts instead of walnuts. Yum! I conveniently had all the ingredients to make this for an impromptu dinner party. I think I like a little more topping on my crisp/crumble, so I probably would double it next time for my preferences. When I was a kid, we perfected the scoop to get more topping than apples so whoever was last was mostly just left with apples, haha. The flavouring and texture of the topping was really nice and the bourbon added a little extra something something. The technique to cook the apples first is a good one. Thanks for sharing your version! Thanks for trying my recipe and for the sweet note. I do tend to prefer a higher fruit ratio in my crisps, so let me know if you try it with extra topping! That’s hilarious about your sneaky scooping method, hehe! 1) Did you weigh the 1.5 pounds of apples before peeling/coring/slicing? 2) Other than baking time, will a 9″ pie plate affect anything else? 3) I found some websites claiming tapioca starch and tapioca flour are the same thing. What I have is labeled ‘tapioca starch’. I use it as a pie filling thickener. Do you know if the starch will work? 4) Some of the volume and weight measurements are way off for me. For example, 2 TBSP of Arrowhead Mills Oat Flour is almost 25g for me, not 10g. Which measurements do you usually use, volume or weight? Those apples are beautiful! I wish there was something similar on the East Coast. 2) The crisp might be a bit shallow baked in a 9″ pie pan – I wonder if you’d want to increase it by 25%? 4) I just checked and my Bob’s oat flour weighs 13 g for 2 Tbsp. I would go with the weight! Thank you! The fact that you checked the weight of your oat flour really means a lot to me. Knowing that you care makes me want to try your other recipes. Although you have transitioned to gluten-free, some of your older recipes sound really appealing, too. The crisp came out very well. I like that it wasn’t very sweet and, thus, it paired really well with ice cream and caramel sauce. In fact, I used a lighter caramel sauce than I usually do and it still wasn’t overly sweet. The only issue with the 9″ pie plate was that a bit more surface was exposed. In other words, there was a larger amount of dried apple surface on the top. Therefore, the instructions to redistribute the apples at the end of step 2 are very important. I won’t skip this step next time. No one cared, though. It was finished in no time.